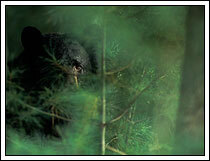 - Black bear photos, Ursus americanus, from Cades Cove, Great Smoky Mountains National Park, Tennessee. Photos of black bears from Kenai Peninsula, Alaska, Wrangell - St. Elias National Park, Alaska, and black bear pictures in British Columbia and Alberta Canada. Eye of the Black Bear. Great Smoky Mountain National Park, TN. Black bear photo in the forest. Great Smoky Mountains Black Bear. Black bear in Cades Cove, Smoky Mountains Park, Tennessee.